Are you looking for a new dog bed for your large furry friend? Having trouble finding a size that’ll fit your dog at the store? Or maybe you’re finding decent sizes for your dog, but you’re not finding very good quality cushioning or material. No matter the case, there are plenty of options online, but that does make the search a little more difficult with having to sort the good from the bad. No worries though, we’ve taken the liberty of doing this for you. Out of all the dog beds we looked at, we’re showing five that’ll make your canine the happiest dog in the world! Here are our top picks. 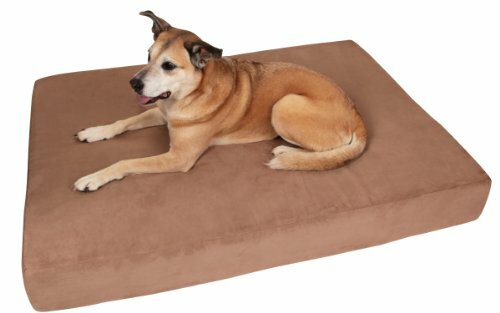 First up on our list is the Big Barker Pillow Top Orthopedic Dog Bed. If you have a large dog, give this to your furry friend and they’ll never want to get off. Big Barker offers this bed in three different sizes — 48-inch, 52-inch, and 60-inch. You can get it as a traditional dog bed, or you can buy it with a headrest built-in. It has a beautiful memory foam pad inside, which is going to be comfort that you and your dog have never felt before, so much so that you might actually trade beds with the dog! It’s easy to keep this one clean as well. It has a removable microfiber cover that you can simply throw in the wash when it’s on the beginnings of wanting to walk on its own. We just can’t get over how high quality this dog bed is — pick this one up, and you’ll never have to worry about buying a dog bed again. 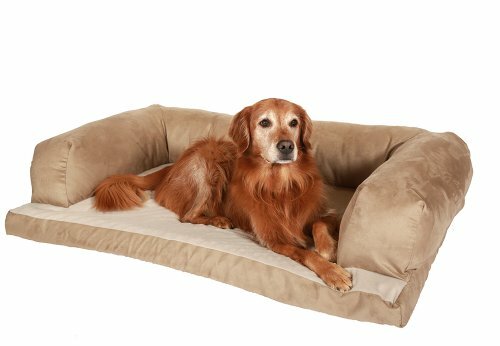 We really like the PetFusion Ultimate Dog Bed & Lounge, too. These dog beds don’t get as big as the Big Barker, but you can choose sizes ranging from 22-inches all the way up to 44-inches. They come in fairly neutral colors (Slate and Brown), so they’ll blend in with almost any style of home. 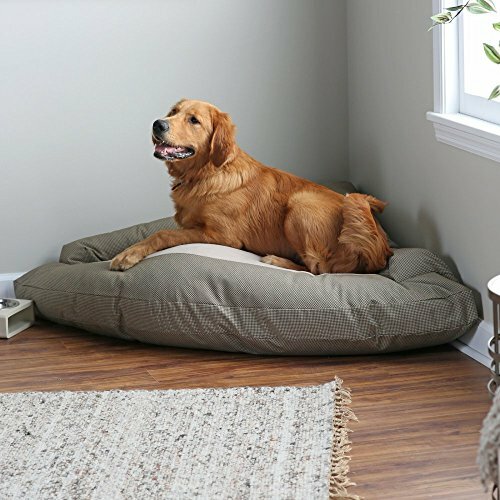 It has a 4-inch thick memory foam pad that will keep your dog comfortable, and with a lined polyfill pillow, your dog will always feel comfortable. This dog bed is literally what it says it is — an extra large couch! OK, not quite, but it sure resembles one. The bed measures out to a whole 54-inches long, and with tough cushions around it, this one will certainly keep a large dog comfortable. It has a removable cover so that you can easily wash the grime off of it without too much hassle. There’s a nice, memory foam pad packed in here, too. If your furry friend is one that likes to spread out and hog the bed, then you might want to pick up the Majestic Pet Rectangle Bed. This is a spacious dog bed — measures in at 42×60″ — so almost any dog can sprawl out and stay comfortable at the same time. This one doesn’t have any memory foam in it, but it is filled with with a poly fill blend. That said, it might not be suitable for old dogs or injured dogs that need the extra support that memory foam provides, but it will be a significant upgrade for any dog that needs an upgrade from their old Walmart bed. The Hidden Valley Corner Bolster Dog Bed might be last up on our list, but it’ll still provide you with the comfort your dog is looking for. The material quality is a little less, but that’s because Hidden Valley is trying to provide a large dog bed for those on a budget. The cover is removable, so you can easily wash the dirt, fur, and grime off in the washer. It’s filled with poly fill as well, so there’s no memory foam here. Your dog will still thank you for it, though! The nice thing about this dog bed is that it fits into a corner so that it’s completely out of the way. Even though there might be higher quality, more durable options on this list, this dog bed by Hidden Valley is still a quality option for those that don’t have all that cash to spend. As you can see, these are all great dog beds for the puppy at home. But if you want to treat your dog to a life of luxury, which one of these dog beds is the best? 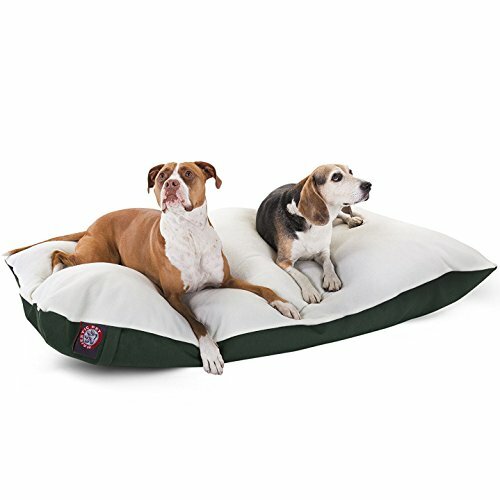 We recommend going with the Big Barker Pillow Top Orthopedic Bed — this dog bed is massive, and will comfortably fit even the largest of canines. In fact, the largest size they offer is 60-inches, and there are at least four colors that you can choose foam. Made out of memory foam, your dog will absolutely love his or her new bed. 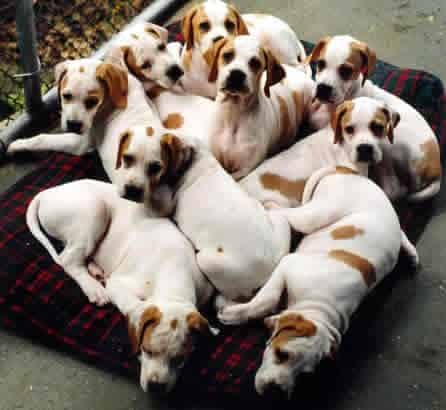 Do you have a favorite large dog bed that you use for your pet? Let us know your own recommendation in the comments section below. We’d love to hear from you!